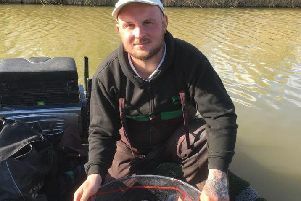 Gale-force winds hampered the presentation of bait for the majority of anglers fishing the latest Rookery Waters match, but Vinny Easy made the most of his favoured peg with a win netting 20lb 10oz. Alternating between bread and corn around the pads he caught carp to 5lb. Runner-up was Kev Shellie, who caught on the straight lead with bread and corn for 44lb 8oz followed by Tony McGregor on 44lb 6oz. Haddon Lodge, Sunday: 1 Peter Telszewski 26lb 4oz; 2 George Bates 19lb 11oz; 3 Martin Quelch 13lb 11oz. Tydd Gote Midweek Open, North Level Drain: 1 John Taylor 5lb 7oz; 2 Mick Asker 4lb 2oz. Tydd Gote Sunday Open, North Level Drain: 1 Paul Bowden 7lb 9oz; 2 Andy Greenwood 6lb 11oz; 3 Colin Button 3lb 10oz. Float Fish Farm Fishery, Wagtail Pool, Saturday: 1 A. Marshall, Float Fish Farm, 45lb 9oz; 2 R. Wells, Decoy, 40lb 1oz; ; 3 S. Dow, Yaxley, 33lb 13oz. Details have been finalised for car parking charges to be introduced for anglers at the start of March at Ferry Meadows. A year-long season ticket will cost £30 when you present your Peterborough & District AA handbook and current rod licence at the Ferry Meadows visitor centre. So it will almost certainly pay to invest in a season ticket for the venue.